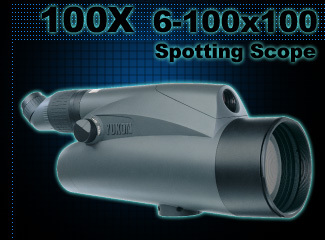 The Yukon 100X is a revolutionary new spotting scope with unique optical characteristics – it has two optical channels, 6-25 x 25mm and 25-100 x 100mm. This is the first spotting scope on the market using this system and that will deliver magnifications from 6x to 100x without the need to change eyepieces. The excellent light gathering capabilities of the 100mm multicoated objective lens makes the picture clear and bright in most viewing conditions. A slight drop off in image quality has to be allowed for at maximum zoom due to the extreme magnification. The unit’s body shell is rugged, weather resistant and, considering the high magnification range, is relatively compact and lightweight. The angled, rotating eyepiece allows use when you are unable to align your viewing position with the scope, such as when lying in a prone position. A lens hood is supplied to reduce flare and protect the front element from rain - it is reversible when not in use.. Fitted with a tripod socket, a sturdy tripod is essential for maximum performance at high magnification. 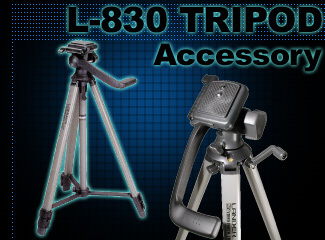 You will need a good steady tripod like this one! A lightweight, full height tripod that will accept all scopes up to the 100X. Features include a 3-way fluid effect pan head, 1/4" Whitworth quick release plate with metal video spring pin, 3-section legs with quick release locks, elevator crank and tension control for the centre column, a large pan handle, lockable centre brace and built-in spirit level. A lightweight, full height tripod that will accept all scopes up to the 100X. Features include a 3-way fluid effect pan head, 1/4" Whitworth quick release plate with metal video spring pin, 3-section legs with quick release locks, elevator crank and tension control for the centre column, a large pan handle, lockable centre brace and built-in spirit level.